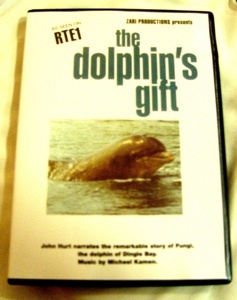 The Dolphin’s Gift tells the story of Fungie, a friendly bottlenosed dolphin that lives at the mouth of Dingle harbor, County Kerry, off the southwest coast of Ireland. This is an extraordinary tale of a wild dolphin and the unique relationships which have developed between Fungie and those who have come into contact with him. To the inhabitants of Dingle Bay, Fungie is their dolphin. Quite simply, he has changed their lives. For though he could leave at any time, Fungie chooses to stay in Dingle Bay, his gentle charm and fun-loving nature win him friends from far and wide. from Jeannine Masset and Rudi Schamhart.